Firstly, I would like to state that my article is dedicated to a little-known Lady named Mary Webb who was very special in the private life of John Ella while they both lived. Although there is much written on the musician John Ella’s musical career and the people he knew, little is known about his family background, so this my true-story is about his family’s humble beginnings and indeed mine. I had known about the musician John Ella for many years but often wondered because of our rare surname if I myself could have a family connection with him. So, because I was skilled in genealogy I made time in the late 1970s to find-out if this was the case. It was pleasing then to know I was related to him. My research papers are now filed with various archives and record offices cited at the end of this article and anyone interested in further research I now courteously invite them to make a visitation to view my papers at the cited repositories. Some early textbooks and the few music-books that do give John Ella a mention state that he was born at Thirsk, this being a small market town in North Yorkshire in an area known by the name “The Vale of Mowbray”1, yet this is not so. However, in one of John’s personal papers, ref. MS88/vi, he has his father Richard’s birth-date and place of birth, i.e., lst. of May, 1769, at Thirsk, but how did his father get to Leicestershire from North Yorkshire in the year 1774, Richard being a small boy, firstly moving to Loughborough, then when a young-adult to nearby Leicester. At the Record Office in Leicester amongst the All Saints Parish Papers for Loughborough, there is a Settlement Certificate (not a removal order in this case), ref. DE1834/1/10 and the names listed moving from Kirkby (now Kirby) Knowle near Thirsk 31st (or 30th) of January 1774 to Loughborough are: John Ella (the musician’s grandfather of the same name), Sarah his wife and their 3 small children Ursula, Mary and Richard. This certificate is signed by the Sheriff for the North Riding of York and also Michael Ella (junior) who was living in Loughborough, having first settled in the Kibworth area of Leicestershire c.1760-1 where he was an Exciseman (a collector of excise-duty and preventing infringement of the excise laws, especially smuggling) he being John’s brother and brother-in-law to Sarah, Michael having invited his brother and family to live in Loughborough, John in the settlement certificate being styled “Yeoman” (a farmer owning his own land), but he and his family had sold-up for a new life further- south of England. See below for constructed family tree. Michael (born 1732) and his brother John (born 1741) were from a large family, their parents being Micheal Ella (senior) and Ursula of Kirby Knowle, indeed John being in his 30s when moving south; Michael c.1774 having later become an Inn Keeper at the Bull’s Head Inn, Loughborough. He was also part-owner of a Canal Boat Building and Freight Company. Later John became a canal construction surveyor, hence the reason for moving to live near his brother. Indeed, the new waterways for transporting goods being smoother and better than the dirt roads and cobbled streets long before the advent of tarred surfaces and the Railways. Richard Ella after his schooling was fortunate to have been given a special apprenticeship to become a baker and confectioner starting in Loughborough then his later placement was in Leicester to qualify for “Freedom of Leicester Town/Borough”, making note that Leicester was indeed a city in ancient-times but became a borough and it was not until 1919 it was made a city again. However, it was traditionally accepted that a city should have a Minster (e.g., York) or a Cathedral, so St. Martin’s civic church was given Cathedral status; but not until 1927. Today, anyone given the Freedom (made a Freeman) would have the title ending with the word “City”, be it by an hereditary descent from an ancestor who was a Freeman, or in an Honorary capacity; although the latter is special and rare. 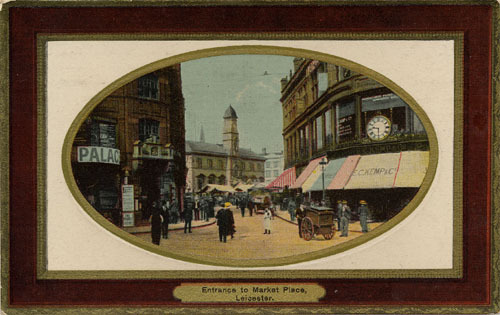 After his apprenticeship, Richard married Kitty (Catherine) Goddard in 1801 at St. Margaret’s church in Leicester, but their home and place of work was to be in the Market Place where they had a Confectionery Shop and the nearby church of St. Martin’s was to be the place of baptism for their children, e.g., Ann born in January 1802 and John (the musician) born in the “same” year, December 1802, also that churchyard was later to be Richard and Kitty’s resting-place after their demise. Richard and Kitty were assisted by “young Ann” their daughter in the confectionery-shop and bakery, later Ann (died 1841)2 taking over the business after the demise of both her parents3, three of her brothers having worked elsewhere in apprenticeships to be bakers and confectioners, but would have also worked in their parents shop and bakery when younger, one being John who later did not finish his apprenticeship like his two brothers, but was made a Freeman “hereditary” after the demise of his father, indeed music being John’s love in life and resulting in him going to France for music lessons before finishing an apprenticeship. However, would this have had his father’s blessings? Whatever was the case, both his parents would not live to see the days of his fame and notoriety and his association with contemporary operatic singers and musicians who today are famous in their own rights. John Ella knew his father Richard was born in Yorkshire and he became inquisitively interested in his family roots and because of this he started to correspond in the latter part of the 1850s with the Yorkshire historian and author William Grainge who was living in Minskip, Yorkshire, John later visiting Yorkshire to see the villages where his ancestors once lived. W. Grainge had written books on the history of Yorkshire and at the time he knew of John Ella he was writing another, published 1859. He titled it The Vale of Mowbray, this including the North Yorkshire market town of Thirsk and surrounding villages. They both reciprocated with information, i.e., William Grainge providing extracts of entries from church parish registers mentioning the Ella family , e.g., the parish church of Kirkby (now Kirby) Knowle where John’s grandfather was born in the village. John Ella gave information on his musical career (up to c. late 1850s) and information on his immediate-family in Leicester, but also he mentioned his cousins who at that time were Lords and Ladies of Wimeswould (now Wymeswold) Manor, this a village north of Loughborough in Leicestershire, not far from the Nottinghamshire border, the last Lordship of the Ella family being Lord William Fisher Ella, died shortly before or at the time of the book’s publication (1859). William’s father was named James, he having married Elizabeth, an only issue, a daughter of Lord William and Lady Elizabeth Fisher. The Fisher monumental floor-slab after their demise was set in the floor of St. Mary’s church, Wymeswold, also some for this Ella family branch being inside the church tower, e.g., James Ella, Gent, died 1834, this with one of two known ELLA coats-of-arms on, Lord William Fisher Ella, died 1859. There are headstones in the churchyard for other members of the Ella family, mostly now eroded. After the demise of William, the Manor and estate were sold by the Trustees of the Ella family to the Paget family, they then in the early 20th century having sold the estate by public auction in separate lots, indeed one could say the Manor and estate was “dismantled”. However, the title “Lord and/or Lady” of Wymeswold Manor has also been put-up for sale more than once in the late 20th century and although it may include a market charter and manorial deeds and other documents, it is now only a “decorative title” because it does not include any property in the former estate. But, what other information did John Ella find-out about his Yorkshire roots, although my own (Raymond’s) research revealed more than William Grainge’s. 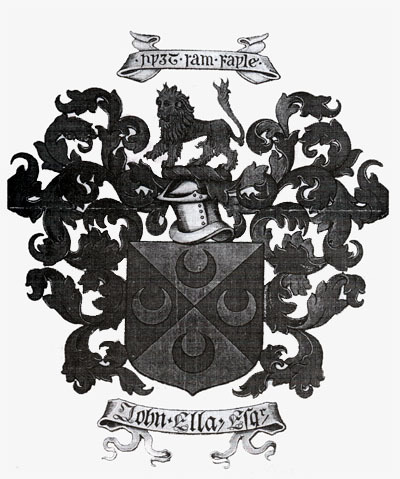 John Ella found out from William Grainge that the Ella family during the English Civil War were loyal and brave supporters for the king’s cause4, but were reduced to beggary after the triumph of the Cromwellian Party, then becoming humble tillers of the soil and in a footnote he quotes two Ella coats-of-arms with a family motto. In 1953 the music critic John Ravell wrote an article on John Ella and this also states that the Ella family were supporters of the king (Charles 1st.) and some were at the battle of Marston Moor in Yorkshire (1644), having had a similar fate. John Ravell’s article however, was an abridged recension of an unpublished Life of Ella, this shorter recension having been printed April 1953 in Music & Letters, vol. XXX1V, number 2. In the 18th century (1700s) Michael Ella (senior)5 of Kirby Knowle was a Yeoman Farmer, other members of the family being corn-millers and one was a millwright (William Ella of Borrowby village nearby) who repaired the wind and water mills in North Yorkshire. His work also included the re-grooving or replacement of the millstones for corn, maze and barley, but not wheat, this a later commodity and often corn after removal of straw would become food for farm animals, e.g., chicken feed, etc. On my visitation to villages near Thirsk in 1988 I noticed that the water mill in Borrowby village had been preserved and was now a home, yet the water mill at Thornton-le-Street where the Ella family lived during the 1670s (after the Civil War) was a ruin yet the cottage annexed to it was in a good condition. I also noticed an old discarded millstone used to make the village sign, likewise for the village of Cowesby where another branch of the Ella family lived. The musician John Ella was also curious about his surname and found-out that although it had become a popular first girl’s name, it was once a singular name for men in Anglo-Saxon times. It is mainly found in modern printed books on the early history for England in the forms of “Aelle or Aella”, yet at that time and indeed long after, there were no fixed last names to be handed-down in a family, i.e., what we call surnames. I now state that W.Grainge was not far wrong when he was suggestive that the Ella family had an earlier origin in the village of Kirk Ella near Hull in Yorkshire. Indeed, they would have been of West Ella and nearby villages to include what is now Kirk Ella, yet once just known as “Ellay, Elley, Elvelay” etc., and later a church was built and sanctified to the patron Saint Andrew of Scotland, hence the Celtic word “kirk” meaning church. Elveley and Elvelay have a meaning of Elf/Elfa’s clearing and before the Domesday Book at said place there was an Elfwine (Elf-like in his walking and running), but scribed in Latin forms of “Alluuini” etc., both Elfa and Ella being short pet-forms for Elfwine. We have and example of this with an early Anglo-Saxon bishop of Lichfield named Elfwine who often signed his name “ELLA” on documents and official charters, yet books on place-names fall-short of this evidence. * Samuel is my line of descent (Raymond). 1. Marriage, 2nd (or 12th) June, 1698, James Ella to Dorothie Harland (at Cowesby Church near Kirby Knowle). 2. Ann Day, baptism 27th Nov., 1733, at Kibworth, Leicestershire. 3. John Ella (musician born 1802) made Freeman of Leicester, 15th of June, 1826. 4. James b. 1675 at Thornton-le-Street, married Dorothie Harland, Cowesby Parish Church, 2nd or12th June 1698. James was buried Leake Parish, 23rd February 1746/7 Yorkshire, a “Corn miller”. 5. Michael (son of James and Dorothie) b 1706/7 at Borrowby village in Leake Parish, buried at Kirby Knowle 1784, “a Yeoman”, Ursula his wife died Thirsk in 1799 and buried in her home-village of Kirby Knowle. 6. Michael (junior) married Ann Day, 7th January 1761 Kibworth Beauchamp Parish Church, Leicestershire. Michael died Loughborough 1799 (left a will). 7. James, son of Michael (junior) b. 1768 married Eizabeth Fisher 26th July 1796 East Bridgford Parish Church, Nottinghamshire. He died 1834 (left a will). He was Lord of Wymeswold Manor. 8. William Fisher Ella, Lord of Wymeswold Manor, b. c. 1801, died Wymeswold 1859 (left a will). 9. John (musician’s grandfather) b. 1741 Kirby Knowle, died Loughborough, Leicestershire 1799. He had married Sarah Morton at Bagby Parish Church, Yorkshire 1767. 10. Richard, b. 1st May 1769 at Thirsk, Yorkshire, died Leicester 1822, a “Freeman of Leicester” (left a will). Had married Kitty (Catherine) Goddard at St. Margaret’s Church, Leicester 16th 10. February 1801. Kitty died 1838 (left a will). 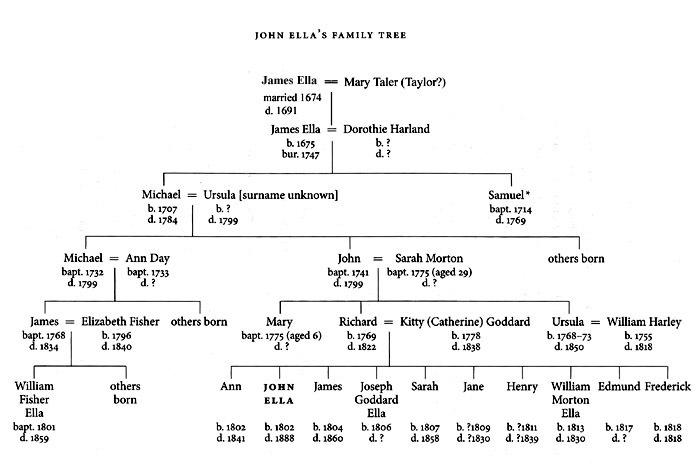 An earlier version of John Ella’s Family Tree was constructed by Dr. Christina Bashford, with help and advice of Raymond (author of this article), for her book, The Pursuit of High Culture: John Ella and Chamber Music in Victorian London (Boydell Press, 2007). Page 16. This coat-of-arms was much earlier attributed to the South Saxon (Sussex) king Ella (Aelle, etc.). Blazon: Per Saltire Or (gold) and Gules (red) 4 crescents counterchanged. The above image has been scanned from Raymond E. O. Ella, Four Anglican Kings of Northumbria (Or Four Yorkshire Anglo-Saxon Crowns), 2nd edition (Otley: Northern Line Design, 2002). Page 23. 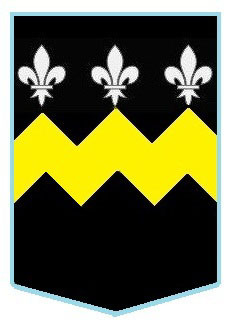 The heraldic blazon (description) of the coat-of-arms is Sable a fess dancetti surmounted of 3 fleur-de-lis Or (gold). 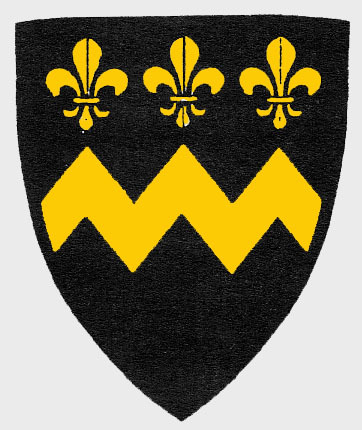 In 1638 and before, the family who were surnamed Ella of Yorkshire had this coat-of-arms; it is what I use today and indeed other members of the Ella family. The above image has been scanned from Raymond E. O. Ella, Four Anglican Kings of Northumbria (Or Four Yorkshire Anglo-Saxon Crowns), 2nd edition (Otley: Northern Line Design, 2002). Page 26. Another shield for the ELLA coat-of-arms: the 3 fleur-de-lis’s are also documented in Argent (silver) but both the fess dancetty (dancettée) and the fleur-de-lis’s in Or (gold) would have been more appropriately in use, i.e., other similar shield. 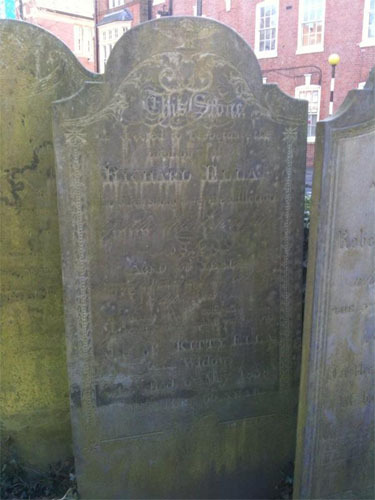 John Ella’s parents are buried in St. Martin’s graveyard, Leicester. The headstone is not in its original place. The above photo was taken by the author; in his family collections there are similar ones taken by a St. Martin’s Cathedral official and Dr. Christina Bashford. This letter, from the musician John Ella’s mother Catherine (also known by her short pet-form Kitty), is in support for him to become a member of the Royal Society of Musicians of Great Britain. 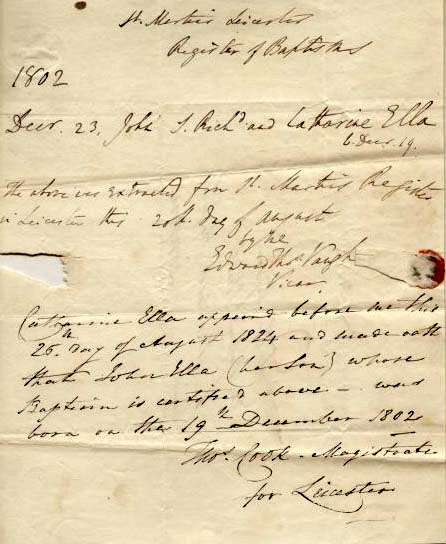 The letter is reproduced here courtesy of the RSM., they having him listed as becoming a member on the 2nd of January, 1825. (Richard, John’s father, had died in 1822). 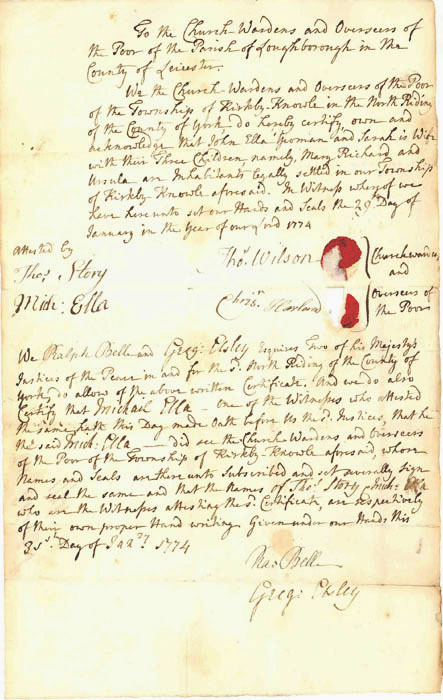 This is a Settlement Certificate (not a removal order*) for the branch of the Ella family who moved in 1774 from Kirkby (now Kirby) Knowle (near Thirsk) in Yorkshire to Loughborough in Leicestershire. The John Ella and his wife Sarah named in the certificate were the grandparents of the Leicester-born (later in 1802) musician John Ella. The permission to reproduce this certificate here has been granted by the Leicestershire, Leicester & Rutland Record Office, ref. DE1834/1/10. * I mention this because some settlement certificates were removal orders of people for other reasons, e.g., committing a crime, base-born, etc., and were a way of reducing the cost for the Overseers of the Poor. 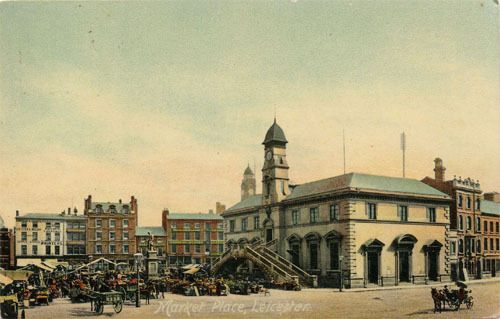 The above three postcards of the Market Place are from Monir Tayeb and Michel Austin’s Berlioz collection. 1. Most people today would know the Vale of Mowbray by another newer title, i.e., Herriot Country, named such after the veterinary surgeon come-author who used the pen-name James Herriot. 2. 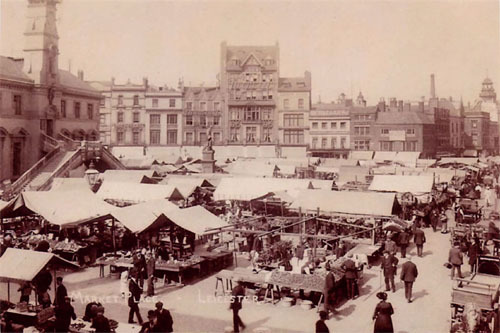 Ann is listed later c.1840-41 in trade directories as a confectioner of the Cheapside area of Leicester. 3. The Midland Counties Railway Companion, Also guides, etc. (1840), printed by R. Allen, Albion Offices, Nottingham. Page 38: A. ELLA Confectioner, Market Place, Leicester. Dealer in Foreign Fruits, Spices &c.
4. A castle or fortification at Thirsk is no longer there but amongst the musician John Ella’s papers there is a mention of a Lt. (Lieutenant) Edmund Ella, he an army officer with a small contingent of troops garrisoned at Thirsk castle in 1660. However, this was the year of the restoration of our Monarchy when the exiled Prince Charles was made King Charles the 2nd. So, it is not clear what Edmund did during the earlier English Civil War. 5. Michael Ella (senior) had a brother Samuel and from him is the present author’s descent. Today some people of older generations may prefer music from their younger years rather than more modern music of what we now call “pop” , i.e., short for “popular” and people in the first half of the 19th century may have had a similar regard to chamber music, but John Ella did is best to promote his music tastes amongst all classes of people, including the gentry and their ladies, indeed chamber music then becoming more “popular”. So one could say that John Ella was a “trend-setter” and because of this and his union, other musicians became “popular”. Some of John’s letters are in various archives and record offices and he kept hand-written copies and some were duplicated with carbon paper, i.e., two writing pages with a carbon sheet in the middle. 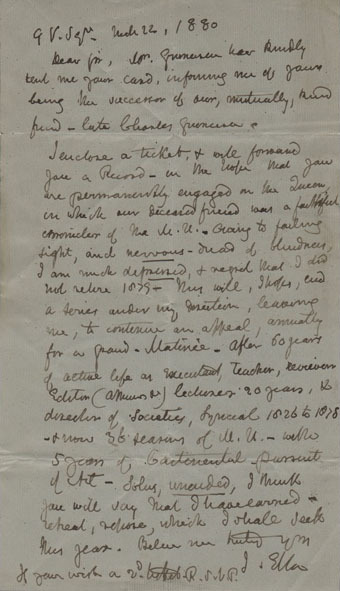 Here is a picture of a copy of a letter written in 1880 at a time when he knew his health was frail and his eye-sight was giving him problems and with-in the following 7 to 8 years he would be blind, indeed certainly at his demise in 1888. However, in his latter years and mainly housebound, he was never lonely because his many friends and colleagues visited him at his home to enjoy each others company with entertaining polite intelligentsia, some having written that “I found John Ella to be in good spirit”, etc., but he never lived long enough to receive a “possibly nominated” knighthood from the Queen (Victoria). Record Office, Leicester, ref. MISC1260, MISC1294 (some early pictures of J. Ella), DE6612 (documents for the Wymeswold Ella family branch). DE1834/1/10, Settlement Certificate, year 1774, not a removal order). East Riding of Yorkshire Archives, Beverley, collection DDX551. 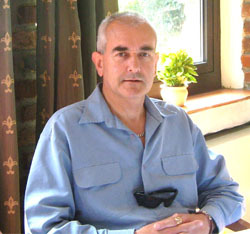 * Raymond E. O. Ella (age 62 on 29 May 2011) is an author-historian and also an artist, having written books and articles for various history magazines and journals. He was formerly a record searcher (manuscripts, etc.) and genealogical adviser for people with Norfolk and Suffolk roots, e.g., some of his research having been done for the famous Packard family in the USA who had a Suffolk origin and he has helped other historians with their research (Dr. Christina Bashford and others). He states that he has had other interesting past-employments. 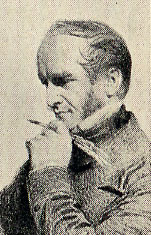 Mr Raymond E. O. Ella is of the senior Yorkshire branch of the Ella family, whereas the musician John Ella (1802-1888) is of the junior Leicestershire branches, yet descents are well-documented after Raymond’s research into his and John’s roots, Raymond having found more documented and architectural evidence than John or even the historian William Grainge knew about. We are most grateful to Mr Ella for having written this article specifically for our site at our invitation. All rights of reproduction reserved. The Hector Berlioz Website was created by Monir Tayeb and Michel Austin on 18 July 1997; this page created on 2 May 2011. © Raymond E. O. Ella. All rights of reproduction reserved. © (unless otherwise stated) Monir Tayeb and Michel Austin.